This is my first submission to Illustration Friday. I decided to try to participate every week so I can get better at drawing and conceptualizing. 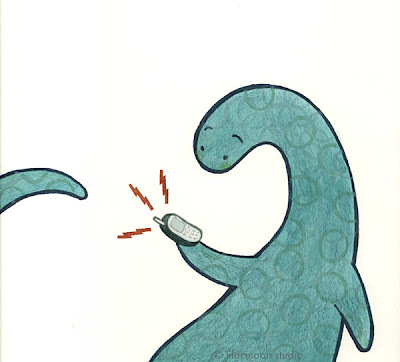 This is a dinosaur who doesn't know what that thing is. I'm not sure how I feel about the result but it was good to try something I've never done before, which was to use watercolor + colored pencils + rubber stamps. Well your combination worked! I love the result. Fun idea, too. cute, i like the way you've used the space available.